'Remember the wisdom of Solomon in the book of Proverbs -- "He that troubleth his own house shall inherit the wind"'. Why does Inherit the Wind (1960) make this list of films I'm reviewing as part of my ongoing research? What does it have to do with human rights? Well, the right to freedom of expression, the right to education and the right to a fair trial, are just three rights which pop into my head. 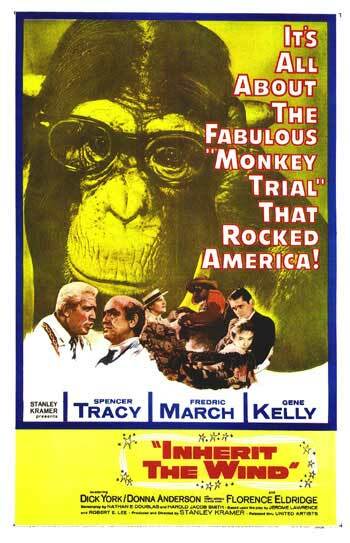 'It's all about the fabulous monkey trial that rocked America'. The movie focuses on the trial of a science teacher accused of the crime of teaching evolution. The trial judge refuses to permit any scientific evidence to be called; this allows for reliance solely on the Bible. The press descend on the town, where a 'witch hunt' has begun to take place. The film is based on a 1955 play by the same name and has been remade a number of times. Starring, in this version, Gene Kelly as a journalist like H.L. Mencken, Spencer Tracey as the defense attorney Henry Drummond (patterned after Clarence Darrow), and Frederic March as prosecutor Matthew Brady (patterned after William Jennings Bryan), the film was written as a parable for McCarthyism. A really excellent film, full of great and witty lines. Enjoy!